Many property owners attempt to exterminate and use trapping methods for ground squirrels and gophers that are largely futile. Unfortunately, the job will get to be too large for property owners and it will require professional help thats where we come in. Having seen first-hand, the destruction that Ground Squirrels and Gophers cause, we highly recommend you arrange for the Gopher Man, (a division of Kastle Kare) to come out and attend to the problem as soon as you notice it. Gophers multiple quickly and the sooner you address the problem, the easier it will be to gain control of it. Mounds of fresh soil are the best sign of gopher presence. Mounds are formed as the gopher digs its tunnel and pushes the loose dirt to the surface. Typically mounds are crescent or horseshoe-shaped when viewed from above. The hole, which is off to one side of the mound, is usually plugged and they can create several mounds in a day. Five species of pocket gophers are found in California, pocket gopher (Thomomys bottae) being most widespread. 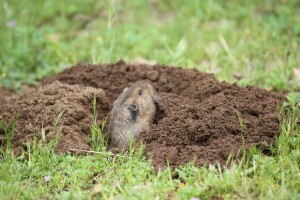 Pocket gophers are burrowing rodents (between 6″ and 10″ that get their name from the fur-lined external cheek pouches, or pockets, that they use for carrying food and nesting materials. They are well equipped for a digging and tunneling lifestyle with powerfully built forequarters, large-clawed front paws, fine short fur that doesnt cake in wet soils, small eyes and small external ears, and highly sensitive facial whiskers to assist movements in the dark. An unusual adaptation is the gophers lips, which can be closed behind the four large incisor teeth to keep dirt out of its mouth when it is using its teeth for digging. 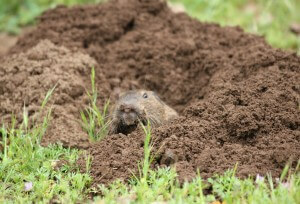 Pocket gophers live in a burrow system that can cover an area of 200 to 2,000 square feet. The burrows are about 2-1/2 to 3-1/2 inches in diameter; feeding burrows are usually 6 to 12 inches below ground, whereas the nest and food storage chamber may be as deep as 6 feet. Gophers seal the openings to the burrow system with earthen plugs. Gophers do not hibernate and are active year-round, although fresh mounding may not be seen. They also can be active at all hours of the day. Gophers usually live alone, except for females with young or when breeding, and may occur in densities of up to 16 to 20 per acre. 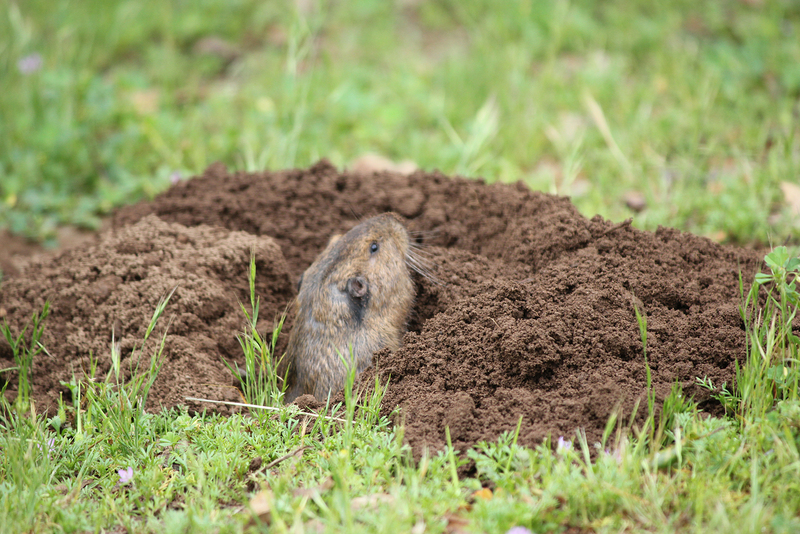 Pocket gophers are herbivorous, most commonly they feed on roots and fleshy portions of plants they encounter while digging. However, sometimes they feed aboveground, venturing only a body length or so from their tunnel opening. Burrow openings used in this manner are called feed holes. They are identified by the absence of a dirt mound and a circular band of clipped vegetation around the hole. Gophers will also pull entire plants into their tunnel from below. The California ground squirrel can be identified by physical as well as behavioral characteristics. Adult ground squirrels can reach an overall length of 18-20 inches with the body slightly longer than the tail. They are gray with lighter flecks distributed over the surface of the back and sides. The nape of the neck has a pair of dark triangular patches that extend just beyond the shoulders. A noticeable white fringe adorns the sides and tip of the tail. Ground squirrels live in unplugged burrows in the ground that are approximately 4 inches across and are active only during the day. Our Gopher Man technicians are highly skilled, trained and determined to get your property free of ground squirrels and gophers quickly. Our initial service consists of coming out to the site and treating all activity. We offer a 30-day, 90% control guarantee on all treated areas. The reason behind the 30-day guarantee is that we are confident we can get rid of existing rodents but there is no way to prevent new gophers from coming back, either through new tunnels or through existing tunnel systems and no pest control company can legitimately guarantee this. In addition to our initial service, we recommend a monthly service, which consists of two visits per month. This helps to ensure that any new activity is treated before it has a chance to destroy the landscape. In these service visits, we are scheduled to come out every other week and walk the entire property, regardless of size, and treat any activity. This is all included in the price of the monthly service. 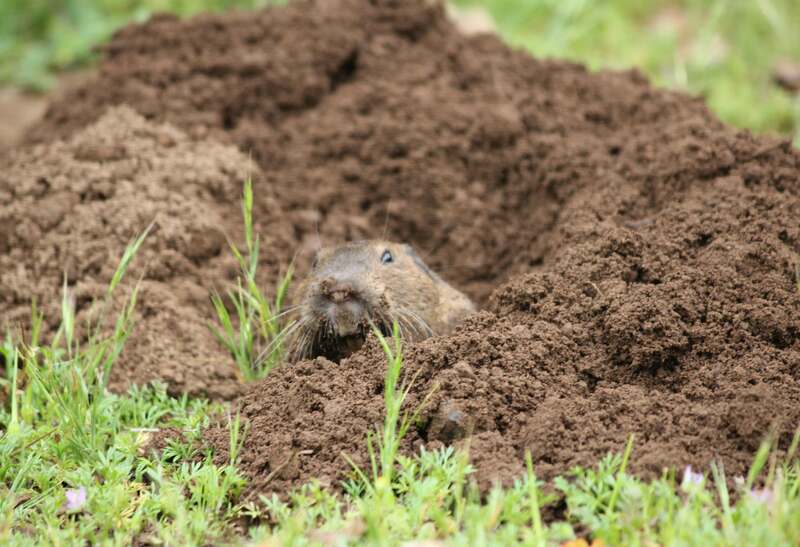 Pocket gophers and ground squirrels are classified as nongame mammals by the California Fish and Game code. Nongame mammals which are found to be injuring crops or other property may be controlled at any time or in any manner that is legal and humane by the owner or tenant of the property. They may also be controlled by federal, state or county officers or employees while acting in their official capacities.